LOOK INTO THE EYES OF SPIDER-PUMPKIN AND DESPAIR. This happened to me while I was browsing the Target website for some Halloween decorations. 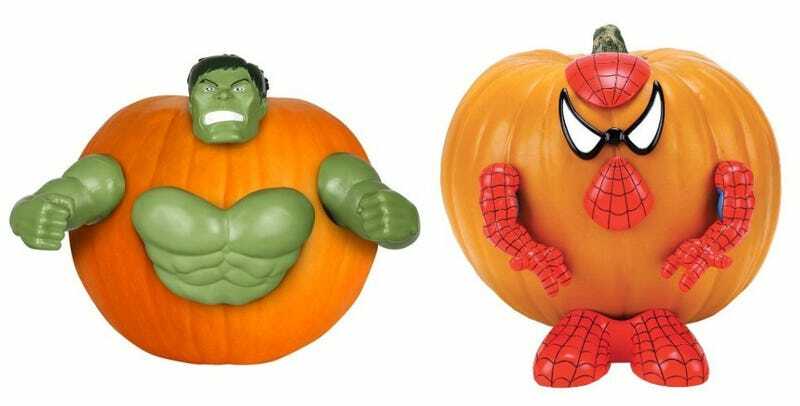 So I obviously googled for more of these unholy spawn of a Jack-O'-Lantern and Mrs. Potato Head, and there are just too many. But there's something about the Hulk's chestplate and no feet (OH GOD WHERE ARE HIS LEGS) and the "face" of that Spider-Man that really freak me out. Here's the Woody looking like he's caught in some pumpkin quicksand and the unsettling grin of a Michelangelo frozen in pumpkin-spiced carbonite. Why not just start Civil War before Marvel can with these horrors? This is something of a sausage-fest, is there something more in a princessy vein? Well, someone ended up stuck in her coach when it turned back into a punpkin. Feel free to look up "pumpkin push ins" for yourself and enjoy the disturbing results for yourself.